Go to original pattern for design DROPS Children 12-26. Size: 3/5 – 6/9 – 10/14 years. 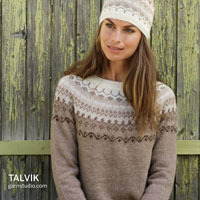 You can get the yarn to make this pattern from	6.40$. Read more. 23 sts x 32 rows on needles size 3 mm / US 2or3 in stockinette sts. = 10 x 10 cm / 4'' x 4''. 20 sts x 20 rows in garter sts on needles size 4.5 mm / US 7 = 10 x 10 cm / 4'' x 4''. Pattern: See diagrams M.1 and M.2, the diagrams show 1 repeat. Cast on 96-108-120 sts on needles size 3 mm / US 2or3 with Karisma Superwash. 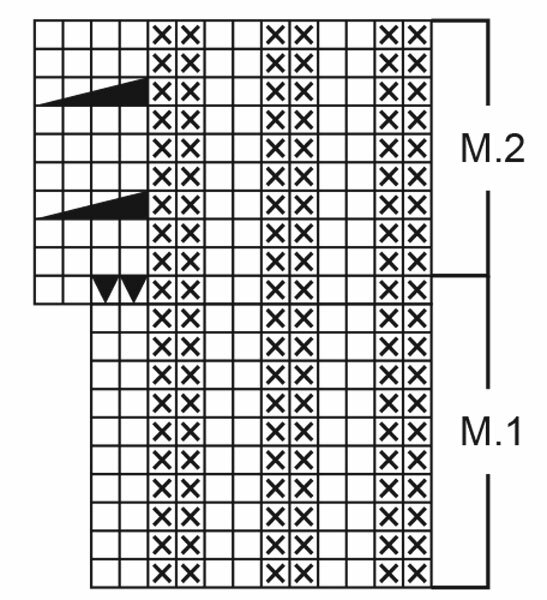 Work diagram M.1 and increase on the last round as shown in diagram = 112-126-140 sts. Continue to work diagram M.2. REMEMBER THE GAUGE! 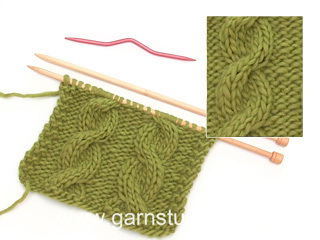 When the piece measures 17-19-21 cm / 6 3/4"-7½"-8 1/4" knit the 4 sts in each cable tog 2 and 2 = 96-108-120 sts. Work 3 rounds with K2, P2 and then purl the P2’s tog to P1 = 72-81-90 sts. Work 3 rounds with K2, P1, and then knit the K2’s tog to K1 = 48-54-60 sts. Work 3 rounds with K1, P1 and then K2 tog around = 24-27-30 sts. Cut the yarn and pull it through the remaining sts, pull tight and fasten. The hat now measures 21-23-25 cm / 8 1/4"-9"-9 3/4". 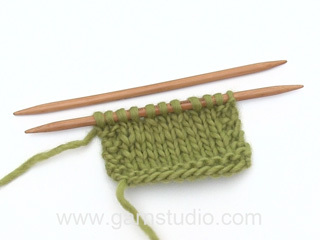 Knitting gauge: 20 sts x 20 rows in garter sts on needles size 4.5 mm / US 7 = 10 x 10 cm / 4'' x 4''. Rib: *K2, P2*, repeat from *-*. Garter sts (back and forth on needle): Knit all rows. Work begins at the bottom of the front piece and you bind off at the bottom of the back piece, and knit the neck itself at the end. Cast on 42-46-50 sts on needles size 4.5 mm / US 7 with Karisma Superwash and knit garter sts. REMEMBER THE GAUGE! When the piece measures 7-9-10 cm / 2 3/4"-3½"-4" bind off the middle 14-16-18 sts for the neck. Work each shoulder piece separately. 1st shoulder piece: = 14-15-16 sts. 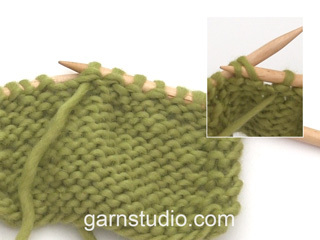 Continue in garter sts – at the same time bind off at beg of every row that starts at the neck side: 3 sts 1 time, 2 sts 1 time and 1 st 3 times = 6-7-8 sts. When the piece measures 11-13-15 cm / 4½"-5"-6" insert a marker (= the middle of the shoulder) – continue to measure from this point. On the next row cast on 2 new sts at the neck side and put all sts on a holder. 2nd shoulder piece: Work as the 1st shoulder piece. Back piece: Put sts from one of the shoulder pieces back on needle, cast on 26-28-30 sts and put sts from the other shoulder piece on the same needle = 42-46-50 sts. Continue in garter sts. 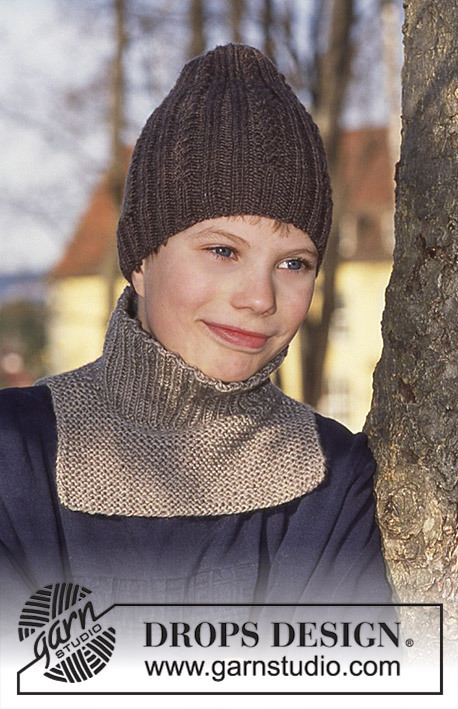 When the piece measures 11-13-15 cm / 4½"-5"-6" from the shoulder, bind off. 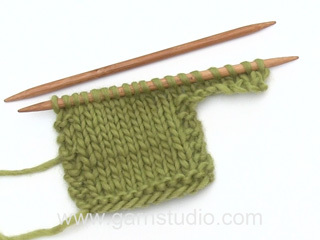 Neck: Pick up approx 76-86 sts (divisible by 4) around the neck on double pointed needles size 3 mm / US 2or3. Purl 1 round, and Knit 1 round. At the same time inc number of sts evenly distributed on round to 92-98-102. Continue in Rib: K2, P2. When the neck measures 7-8-9 cm / 2 3/4"-3"-3½" bind off in Rib. = Put 2 sts on cable needle behind your knitting, K2, K2 from cable needle. Bonjour Mme Bruère, le devant et le dos du plastron se tricotent bien au point mousse, les explications ont été ajustées. Merci. Bon tricot! Bonjour Mme Netchitailo, les quantités sont indiquées au poids pour chaque taille à droite de la photo sous l'onglet "Fournitures", ainsi, pour le tour du cou, il faut 100 g de Karisma, soit 100/50 g la pelote de Karisma = 2 pelotes. Bon tricot! Hej, 80 cm blir för lång, du kan använda en 40 cm på halsen. Finns måtten för löskragen på internet? Ni refererar till sidan 2. Nej, men hvis du overholder strikkefastheden med 20 m på 10 cm, så får du 20 cm hvis du slår 40 m op. God fornøjelse!